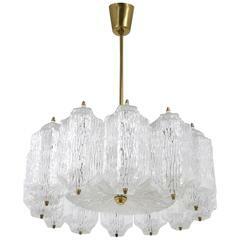 Very nice 1950s textured glass and brass chandelier by J T Kalmar Vienna Austria, in original condition. Kalmar was the most important producer of premium quality chandeliers beside Bakalowits, Nikoll and Lobmeyr in Austria from 1940-1970. Five E 14 sockets. Dimensions: Diameter 42 cm height 80 cm as with all vintage electrical equipment, it is advisable to have it checked by a qualified electrician. 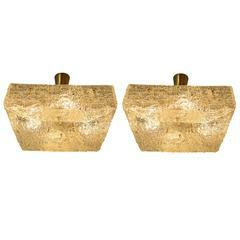 Two Kalmar chandeliers, textured glass, Austria, 1950s. Original condition. J.T. 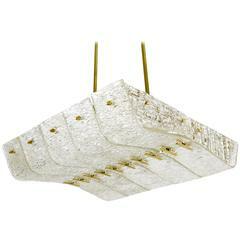 Kalmar chandelier, 1950s. Original condition.